By 2010 only Toka, Thika and Iringa remained, the Toronto Zoo having lost four elephants in as many years and others before that. After the zoo decided to end its elephant program, the Toronto City Council voted to relocate the elephants to PAWS. You can easily identify African elephant Toka as she navigates the grass-covered hills at ARK 2000, together with Maggie and Lulu. Her long tusks make her stand out from the other elephants. The 48-year-old elephant came to PAWS in October 2013 from the Toronto Zoo, with Thika and Iringa. Iringa was humanely euthanized in July 2015 following a long history of degenerative joint and foot disease, the leading reasons for euthanizing elephants in captivity. Toka was only four years old when she arrived in Toronto – one of seven wild-caught elephants imported from Mozambique in 1974 (she is the only surviving member of the group). She likely was the victim of a cull, meaning that she witnessed the massacre of her protective mother and aunts, before being thrust into a crate and shipped across the world. 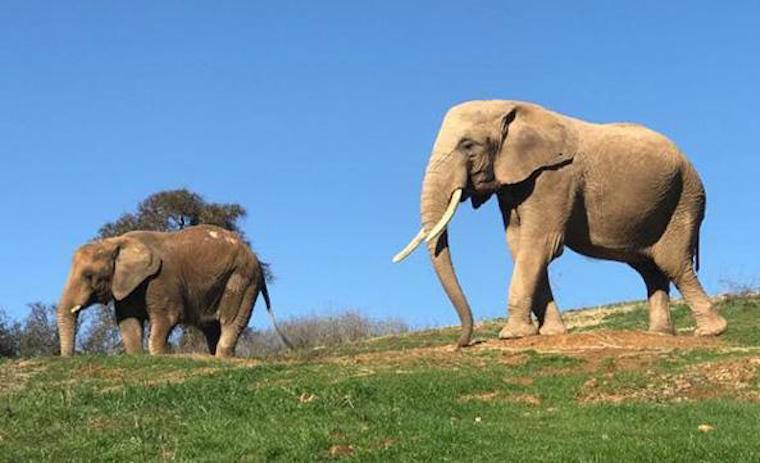 Toka would spend the next 39 years at the zoo, living in close quarters amid a number of elephants and the ever-shifting alliances between them. She gave birth to a female calf named Toronto, who died at age 10. By 2010 only Toka, Thika and Iringa remained, the Toronto Zoo having lost four elephants in as many years and others before that. After the zoo decided to end its elephant program, the Toronto City Council voted to relocate the elephants to PAWS. Today Toka spends her days immersed in nature, foraging throughout the day on grass, trees and other fresh vegetation. She loves being close to friends Lulu and Maggie, as the group moves together throughout their habitat. 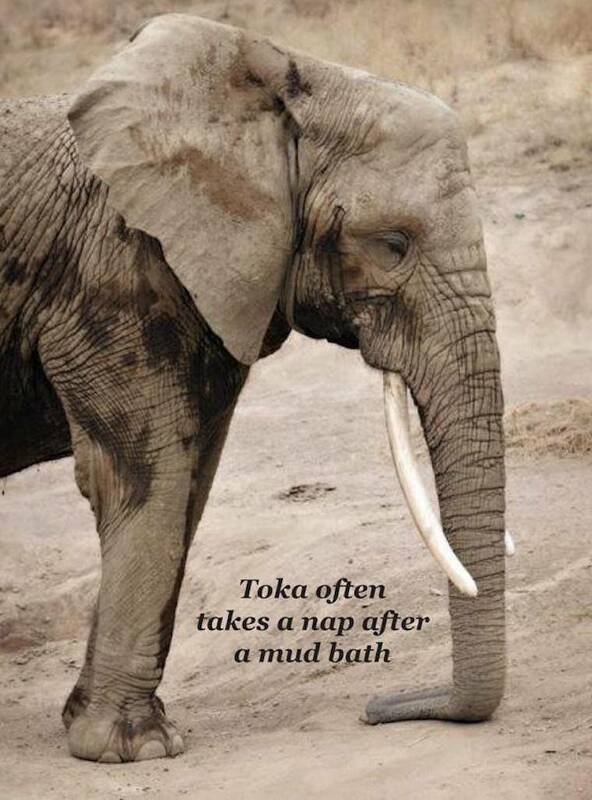 If there is one thing Toka adores, it’s a good mud bath. She can often be found stomping, splashing and rolling in the mud, which serves to protect her skin from insects and the sun. Toka’s caregivers report that she is relaxed and calm during husbandry care and training, and that bananas send her into a blissful state as she savors this special treat. Some people think that all elephants get along because they are a social species, but this isn’t always the case. Female elephants naturally would only live with their mothers, daughters, other female family members and their offspring – and not with unrelated elephants. In captivity, elephants are haphazardly brought together. Not only are they not from the same family, they aren’t even from the same locale. Home countries for the African elephants at PAWS include Zimbabwe, Mozambique, Swaziland and South Africa. These days Thika (the only captive born elephant among the Africans) spends her time with long-time PAWS resident Mara. She can often be seen following Mara around like a little sister follows a big sister. Toka is most relaxed with Maggie and Lulu and is never far from them. PAWS’ first priority is always the health and welfare of our animals. By closely monitoring the elephants’ behaviors and honoring their choices, they have the most stress-free and comfortable lives possible – which is how it should be.